Every now and then my kids and I get into a battle about which chores are required and which are optional. When school started this year we sat down and had a family meeting about what was expected from everyone and when. I carefully explained that just because they were in school all day didn’t mean they weren’t still responsible for contributing to the daily household chores. And of course, school brings with it an entirely separate set of responsibilities. With only a limited amount of hours in a day we found it necessary to establish which of our list of jobs would be performed when. The kids helped me make this list of things that had to be done everyday as a means of personally taking responsibility for ourselves. We started with our list of household chores. – Sleeping leaves us with an unmade bed so that is, logically, the first responsibility of the day. – And, as long as we eat every day there will be dishes to do EVERY DAY so that was priority number two on our list of household chores. – Each night before bed it makes sense to pick up our rooms and straighten our toys so the following day can start fresh. – I have a tendency to pile the stairs with random objects I find throughout the house during the day that are in need of being put away so cleaning off the stairs is also a daily requirement. – Practicing the piano isn’t necessarily a household job but it is a daily requirement and I love the sound of a piano in the background of my home so I consider it a way for us to make our home wonderful! Taking care of our bodies also becomes a general topic of conversation, “Mom, why do I have to take a shower EVERYDAY? I’m not even dirty!” Well, children, in this house we clean ourselves, EVERY DAY! End. Of. Discussion. – Wearing clean clothes is also necessary as a courtesy of our friends, family, and neighborhood dogs. – Genetically we don’t have much going for us by way of teeth. As long as I am paying the dental bills each year everyone in this house must brush TWICE A DAY! School is like a job for kids. You must show up on time, you must do what your boss (teacher) tells you to do, and it is your responsibility to LEARN the things you are taught. This means getting good grades and WORKING HARD to stay up with the class. – Elementary school homework is rare and really very simple. There isn’t any reason not to get it all done in a matter of a few minutes each day! – Spelling test practice takes place during breakfast. At this time of day we are all together and the kids are excited to go to school, motivation is at a high first thing in the morning. – Reading has rarely been seen as a chore in this house. Rather, reading for 20 minutes each night before bed is something we all look forward to. – WHERE IS MY LIBRARY BOOK??? AHHHHH!!!! Nope, no more. We identify the location of our library books every day, not only so they don’t get misplaced but so we can use them and make it worth our efforts of bringing them home. With busy lives of school, housework, piano lessons, soccer games, baseball practice, and playing with friends it is easy to forget, or claim we don’t have the time, to develop and maintain a spiritual relationship with our chosen form of deity. However, by making this a daily priority our children will be better prepared to follow the moral guidelines of our religious beliefs, especially when they are older and find themselves in precarious situations. – Praying at mealtime, before bed, and when we wake up reminds us of our blessings and helps us travel throughout the day with gratitude in our hearts. – Reading scripture or other religious material demonstrates the importance of spiritual knowledge as well as secular knowledge. My children are 1, 3, 6, and 8 years old. 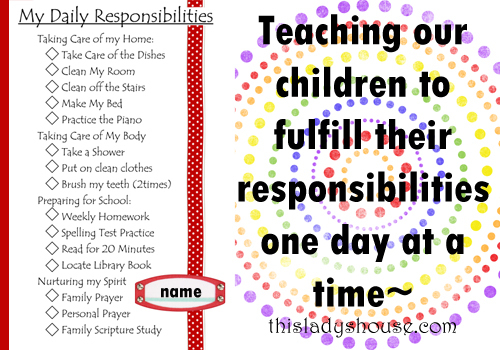 This is a big list with a lot of responsibilities on it, especially for the little ones. But making these things known at an early age will teach them to respect their homes and their bodies as well as preparing them to gain a valuable education. 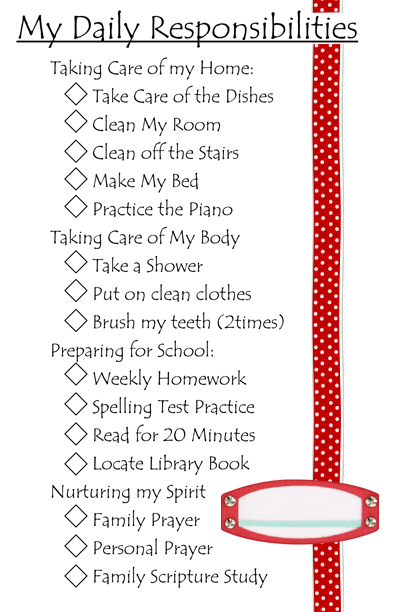 As a parent it is my only hope to raise my children to be happy, successful, functioning adults and this list of daily responsibilities is something they will benefit from EVERY DAY! As a general rule I’m not a big fan of checklists; however, J5 HATES to be told what to do and she HATES to be told to hurry (of course she is, I’m very sure, the slowest child on the planet). So, to limit the amount of bossing, hounding, nagging, and yelling I printed the list of daily responsibilities for each of the kids to have in their rooms. Now, I no longer have to yell at them to pick up their rooms, I simply have to say, “have you finished all of your daily responsibilities?” No friends, no favors, no freedoms – until it is done. Think I’m a little strict? Read my “Meanest Mother in the World” post and see just how bad things can get, when the kids choose.